Pearl farmed for many years and then worked for the Chicago and Eastern Illinois Railroad. They always lived in or near Kell, Illinois, and raised two children together. When Pearl died on 21 April 1979, it marked the end of a wonderful seventy-two year marriage. 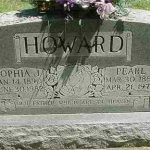 Following Pearl’s death, Sophia spent a few months with her younger sister Eula Osborn of Texico, and then returned home to Kell where she lived alone until the Lord called her home on 30 June 1982. Both funerals for Pearl and Sophia were conducted at the Osborn Funeral Home in Kell, and both are buried in the Jordan Chapel Cemetary, about halfway between Dix and Texico. Maurice Earl Howard was born 3 January 1911 in Kell, Illinois. He married on 3 September 1933 to Blanche Adams. [Blanche Adams was born on the same day as her husband, 2 January 1911, to Orley Oscar Adams (1881-1953) and Martha Samantha Daniels (“Mattie”) (1886-1964).] Blanche was a farmer and the two lived in Sibley, Illinois. They had three children together, all listed below. Blanche died in 1960 and was buried in Donoho Prairie Cemetery, along with an infant son. Following Blanche’s death in 1960, Maurice remarried to Ferne Prosise Garrison on 26 May 1961. [Ferne Garrison was born on 18 June 1932, north of Kell, Illinois.] They were married in the Cartter Christian Church in Cartter, Illinois. Maurice and Ferne had one child, Deborah, listed below. Maurice also had four step-children he helped raise, who in turn had a number of their own children. [The step-children were Steven Lee Garrison (born 24 September 1952), Stanley Gene Garrison (born 11 December 1954), Vicki Lynn Garrison (born 17 September 1957), and Kenneth Dale Garrison (born 19 December 1958).] Maurice had lived most of his life near Kell, with the exception of the short time he lived at Sibley, Illinois, where he worked as a farmer. After he and Ferne were married, he worked for Acco Babcock Co. of Salem. He retired in 1972 and in retirement enjoyed his flowers, yard, and garden. Maurice died on 11 May 2001 and Ferne died on 29 May 2014, both in Salem. They are buried in Harveys Point Cemetery in Marion County, Illinois. Dewaine Howard was born and died on 8 September 1943 to Maurice and Blanche Claybourn. He is buried at the Donoho Prairie Cemetery, east of Kell, Illinois. Linda Kay Howard was born on 30 October 1945 in Kell, Illinois, to Maurice and Blanche Claybourn. She married (1st) to George Perry in about 1960 and together they had a son. Linda married (2nd) to Mr. Wisher in about 1968, (3rd) to Mr. Hays in about 1977, and (4th) to Garry W. Knoblauch in about 1988. Linda died on 14 February 1993 in Clover, York County, South Carolina. George Eric Perry was born on 1 January 1966. Sandra Gay Howard was born on 8 March 1947 in Kell, Illinois, to Maurice and Blanche Claybourn. She married Donald Meyers on 26 September 1969 in Cowden, Illinois. Later they lived in Salem, Illinois. Donald worked for the Farthing Vet. Supply Co. of Odin, Illinois, and Saundra had a day care center for small children in Salem, Illinois. Together they had one son. Brandt Aaron Meyers was born on 25 February 1973. Deborah Sue Howard was born on 26 September 1966 to Maurice and Ferne Claybourn. Deborah worked as a teacher for the handicapped children at the Warren G. Murray Children Center in Centralia, Illinois, and lived in Kell with her parents. She married Don Shuler. Clydia Pauline Howard was born on 4 October 1917 in Kell, Illinois. She married William Duncan Byars in about 1937. [William Byars was born on 10 September 1916 in Jefferson County, Illinois. He died on 28 March 2011 in Okmulgee, Oklahoma.] They had a son, William, but the two separated. Clydia lived a number of years with William and his second wife Caron due to an illness that Clydia suffered from. During this period all three lived on acreage north of Okmulgee. Clydia was a member of the Nazarene Church in Okmulgee, Oklahoma. She worked many years as a Dental Tech in Okmulgee and also worked at the Rehab Center at Oklahoma State University. Clydia died on 19 May 2006 and is buried at Jordan Chapel Cemetery in Jefferson County, Illinois. William Robert Byars was born on 31 May 1938. At the age of 17 he enlisted in the Air Force, where he spent four years. While in the Air Force he met and married Jeanne Koch of Madison, Wisconsin. He was discharged from the Air Force in 1960. They had two daughters, Pamela and Paula, listed below. William and Jeanne divorced and he remarried on 5 May 1967 to Caron Ann Weedman Palmer of Denver. [Caron Ann Weedman was born in 1942. She had a son from a prior marriage, Calvin Reid Palmer, who was born in 1965.] They were married in the First Methodist Church of Golden, Colorado. William Robert lived and worked in Denver for several years but in May of 1971 he and Caron moved to Okmulgee, Oklahoma, so that he could go back to school to learn heating and air conditioning work. He graduated with honors and also took a pilot training course, receiving his commercial license. He owned his own plane and flying was a primary hobby. Eventually he worked for the Oklahoma Electric Co. William and Caron Ann had three sons, listed below. Pamela Jane Byars was born on 22 September 1961 in Denver, Colorado, to Robert and Jeanne Claybourn. At an early age she moved to Wisconsin and then later attended college in Minnesota. She married Randy Elvin Sanders on 5 March 1983 in the Woodcrest Baptist Church of Fridley, Minnesota. Randy was born on 4 January 1957 in Clay County, Minnesota, and worked in a computer plant. The two lived in St. Paul, Minnesota and had one son, Johnathon. Johnathon Randal Sanders was born on 12 May 1985 in Hennepin County, Minnesota. He married Lisa Ann Strand on 3 October 2009 in Ramsey County, Minnesota. Paula Jean Byars was born on 7 March 1964 in Denver, Colorado, to Robert and Jeanne Claybourn. At an early age she moved to Wisconsin before eventually settling in Alhambra, California. She worked as an assistant to the editor of Teen Magazine in Los Angeles, California. She married on 3 September 1994 in Ramsey County, Minnesota, to Nurdin (or Noordin) S. Bhanji (born in about 1965). Christopher Dean Byars was born on 14 August 1974 in Tulsa, Oklahoma, to Robert and Caron Claybourn. Todd Alan Byars was born on 12 January 1979 in Okmulgee, Oklahoma, to Robert and Caron Claybourn. Jason Aaron Byars was born on 8 January 1982 in Okmulgee, Oklahoma, to Robert and Caron Claybourn. He married on 13 February 2009 in Comal County, Texas, to Alyssa D. Bagnall (born in about 1989).